We live in a world where 30-second commercials offer instant solutions, but we shouldn't really be surprised when easy solutions don't work. There are no magic bullets, no quick fixes on the path to lasting change - and deep inside we all know this. Programs that promise easy change fail because they gloss over the necessary stages that people have to go through on the path to lasting change. For example; people who regain more weight than they lost by following the latest fad diet are victims of programs that ignore the need for a lifestyle change. 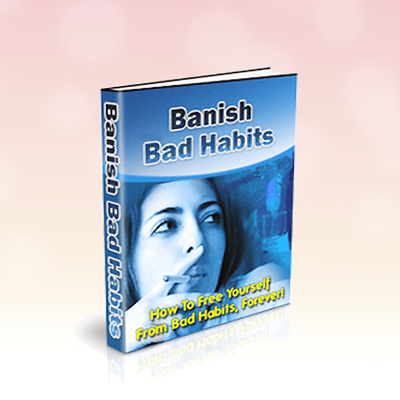 This informative ebook will give you the information and strategy you need to free yourself from bad habits forever. You will be shown how it's easier to promote a healthy new habit than to get rid of the old one that's causing all the misery. Trying too hard to break a habit is usually a recipe for failure. As long as you're focused on the old habit, you're like a soldier fighting with one hand tied behind his back. The key to freeing yourself from bad habits is to change your lifestyle. Focusing on your new lifestyle is like freeing the hand tied behind your back - suddenly you have power to bring about the change you desire. A total lifestyle change isn't something that happens overnight, it happens one day at a time, and it starts when you begin to focus on the solution instead of the problem. Whatever it is, you can beat the problem if you take the time to reevaluate your life. It will take a commitment on your part, but you have already taken the hardest step by consciously recognizing the problem. The next step is much easier. Note - This is a digital-download product; no physical product is shipped.